For the new maxi naked MT-10, “the flagship” of the MT range, now available specific products to improve handling and performance. 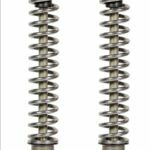 Rear shock series M46KD, M46K and M46R multiadjustable in the Compression, teh Rebound, the Length and the Spring Preload adjustments. The spring preload is offered also in hydraulic version, with the latest IK (integrated-knob adjuster) model. On demand, the monoshock is available also in Shadow and Dark Series. Fork kit type FKS (spring kit) and F12R (complete hydraulic cartridge, multiadjustable in Compression, Rebound, Spring Preload). Dedicated setting and spring rates, based on the driver weight. For the new 700 twin-cylinder, available specific products with dedicated hydraulic setting and springs, based on the weight of the driver, for better setup and performance. For the new 300cc Yamaha naked bike, have been developed specific products to improve performance and handling. Dedicated setting and spring rates, based on the driver weight, are also available. The F25SA Sealed Hydraulic Fork kit fully replace all the existing original fork internals, transforming the original fork in a new damping system fully-adjustable on Spring Preload and on asymmetric functions of Compression and Rebound. The F25SA fork kit is especially suitable for Sports and Racing use. No modification to the original fork is required to fit the fork kit. For the CBR 650 F m.y.2014 are available specific performance products to improve handling and settingperformance and setup. 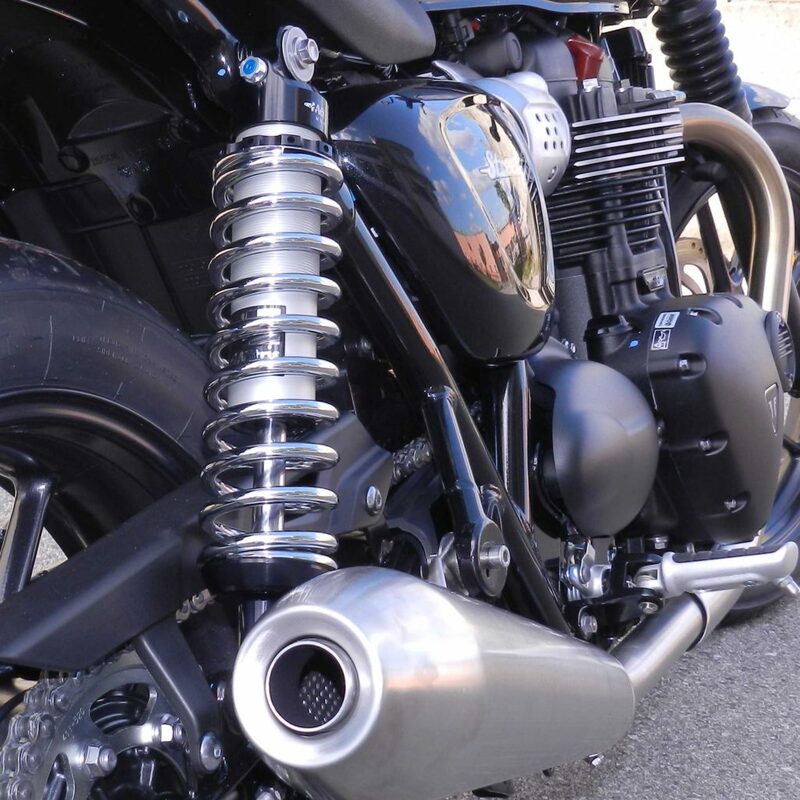 Added on pricelist specific products to customize and improve the performance, handling and comfort of the “classic” Triumph StreetTwin 900. 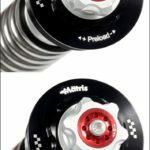 Rear suspension set (Twin series M40D & M40KC) adjustable on Compression, Rebound, Length and SpringPreload. 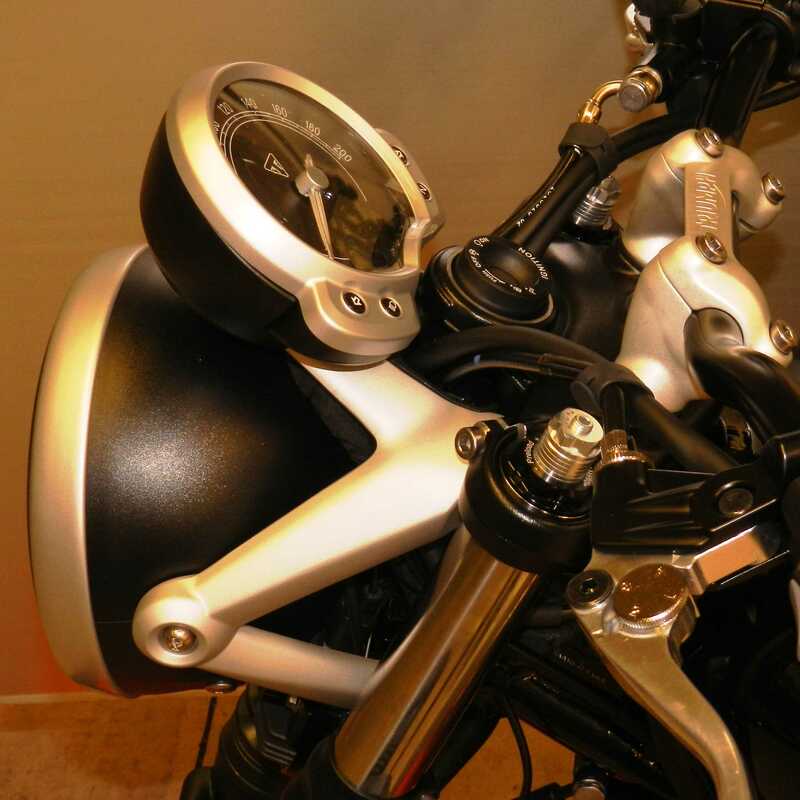 The Twin range is available in “Chromed” or “BlackEdition” version, to optimize the bike look. Fork kit series FKE & FSE (spring set and preload adjustment) and the “full adjustable” newest series F15K (Compression, Rebound, Spring Preload multiadjustable hydraulic cartridge) to modify the conventional non-adjustable Bonneville fork in a fully-adjustable fork, allowing a greater custom setting. For the entry level Ducati Scranbler 400 Sixty2, now available specific products to improve handling and performance. Rear shock type M46KD, multiadjustable in Rebound, Length and Spring Preload (standard & hydraulic system). 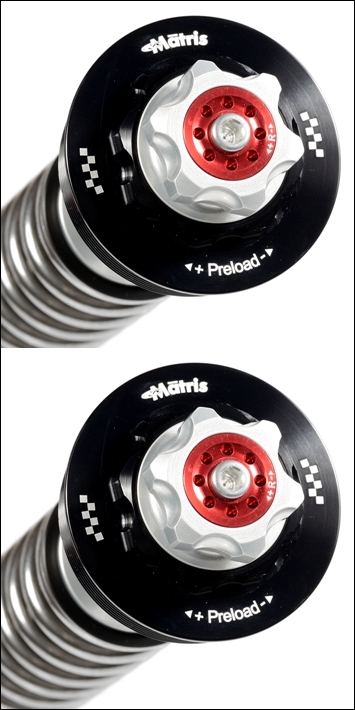 On demand, the rear shock is also available in “DarkSeries” (with black spring). 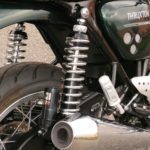 Fork kit type FKE (spring set + preload adj.) and type F15K (fully adjustable cartridge kit) with dedicated spring rates, based on the driver weight. The fork kits are fully reversible and no modification to the original fork is required for assembly. Per la attesissima nuova AfricaTwin, sono ora disponibili specifici prodotti per migliorare assetto e precisione di guida. Mono posteriore serie M46K-X, appositamente studiato, pluriregolabile in Compressione, Estensione, Interasse e Precarico Molla (flex-knob system). Kit Forcella serie F12R-X, cartuccia idraulica completa, pluriregolabile in Compressione, Estensione e Precarico Molla). Il kit forcella è totalmente reversibile e il montaggio non richiede nessuna modifica della forcella originale. To customize and improve the performance, handling and comfort of the awaited custom V9 of MG, “classic” Roamer and “aggressive” Bobber, now added on pricelist specific products. Fork kit series FKE (spring set and preload adjustment) and the “full adjustable” newest series F15K (Compression, Rebound, Spring Preload multiadjustable hydraulic cartridge) to modify the conventional non-adjustable V9 fork in a fully-adjustable fork, allowing a greater custom setting. 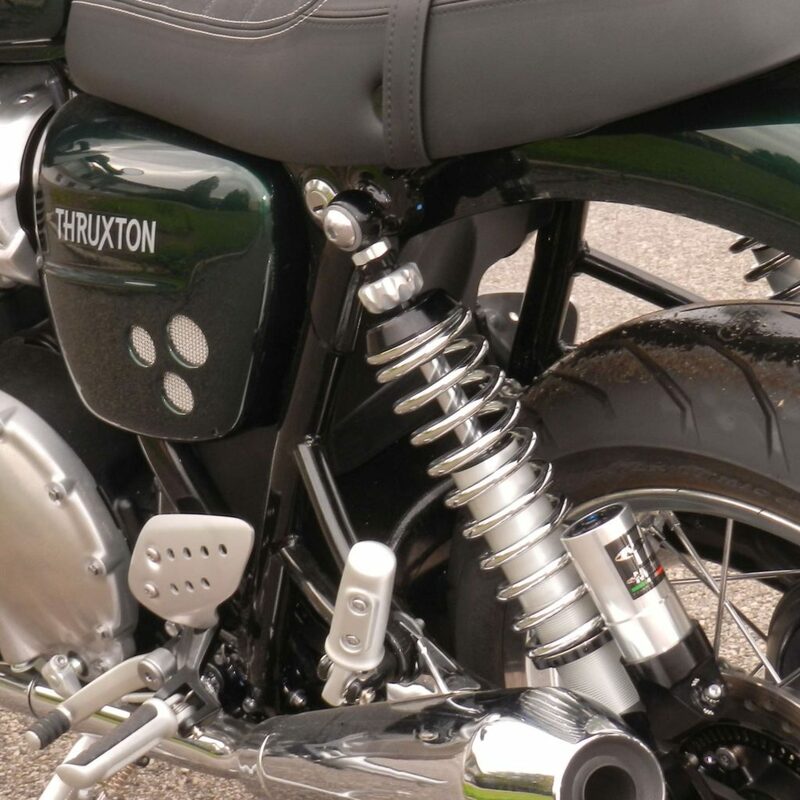 To customize and improve the performance, handling and comfort of the “classic” Triumph Bonneville T120, now added on pricelist specific products. 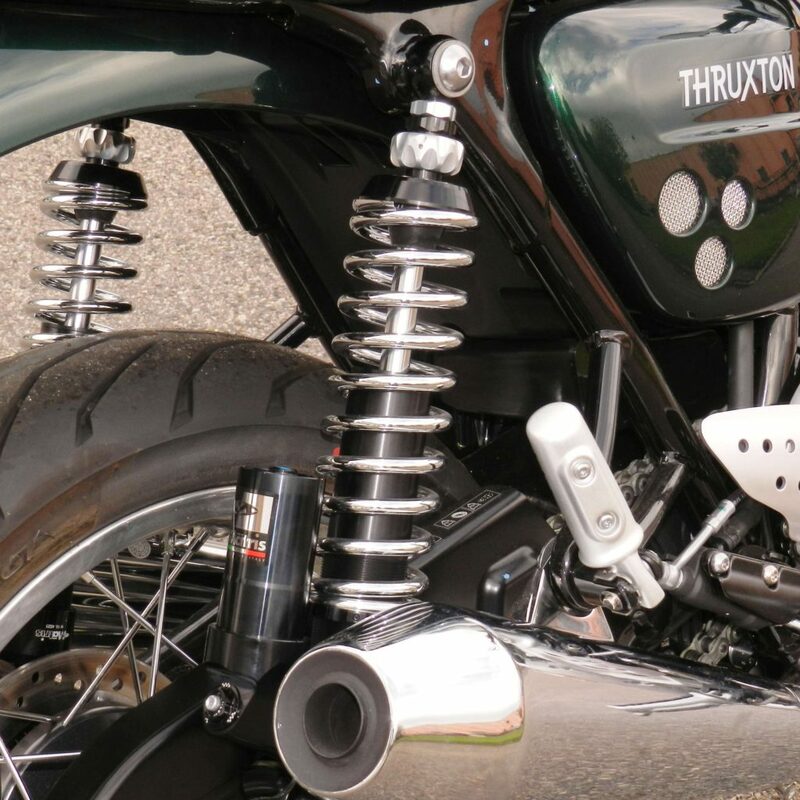 For the new “Modern Classic” cafe racer, Thruxton 1200, added on pricelist specific products to customize and improve the handling and comfort. The rear suspension twin set are adjustable on Compression, Rebound, Length and Spring Preload. The twin sets (series M40D & M40KC) are available in “Chromed” or “BlackEdition” version, to optimize the bike look. For the front fork are available the fork kit series FKE & FSE (spring set and preload adjustment) & the “full adjustable” cartridge kit series F15K (Compression, Rebound, Spring Preload adjustment) to modify the conventional non-adjustable original fork in a fully-adjustable one, allowing a greater custom setting. Dedicated spring rates, based on the driver weight. or the new Yamaha sport bike, now available specific products. Per la nuova sportiva di Yamaha sono ora disponibili prodotti specifici. Possibilità di tarature e molle dedicate in base al peso pilota. For the new naked bikes of Ducati, Monster 821 & 1200, now available a full range of specific products to improve handling and performance. Per le nuove naked di Ducati, Monster 821 & 1200, disponibile una gamma completa di prodotti specifici per migliorare prestazioni e assetto. Possibilità di tarature e molle dedicate in base alle esigenze e peso del pilota. For the highly awaited "Classic" of Ducati, now available specific products to improve handling and performance. Rear shock type M46KD, multiadjustable in Rebound, Length and Spring Preload. The spring preload is offered also in hydraulic version, with the latest IK model, specially designed for the Scrambler 800. (*) Black spring also available on demand. Fork kit type FKS (spring kit), FRK (hidraulic valve and spring kit) and F12S (complete hydraulic cartridge, multiadjustable in Compression, Rebound, Spring Preload). 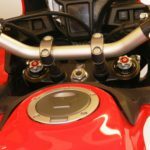 Per la attesissima "Classica" di Ducati sono disponibili prodotti specifici per migliorare assetto e prestazioni. Mono posteriore serie M46KD, pluriregolabile in Estensione, Interasse e Precarico Molla. 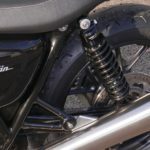 Il precarico molla è proposto anche in versione idrualica con il nuovissimo modello IK, appositamente pensato per la Scrambler 800. Kit Forcella serie FKS (kit molle), FRK (kit valvole idrauliche e molle) e F12S (cartuccia idraulica pluriregolabile in Compressione, Estensione e PrecaricoMolla). (*) Molla nera disponibile a richiesta. To improve performance and set-up on the new KTM entry level sport bike, now available specific products. Per la nuova "entry level" sportiva di KTM sono disponibili prodotti specifici per migliorare setup e prestazioni. For the new "light" Honda sport bike specific products have been developed to improve performance and setup. Per la nuova "piccola" sportiva di Honda sono stati sviluppati prodotti specifici, per migliorare setup e prestazioni. Per il modello Tiger Sport, inseriti a listino nuovi prodotti per uso stradale e sportivo. Added on pricelist a complete range of products dedicated to the Tiger Sport 1050 for road and sport use. 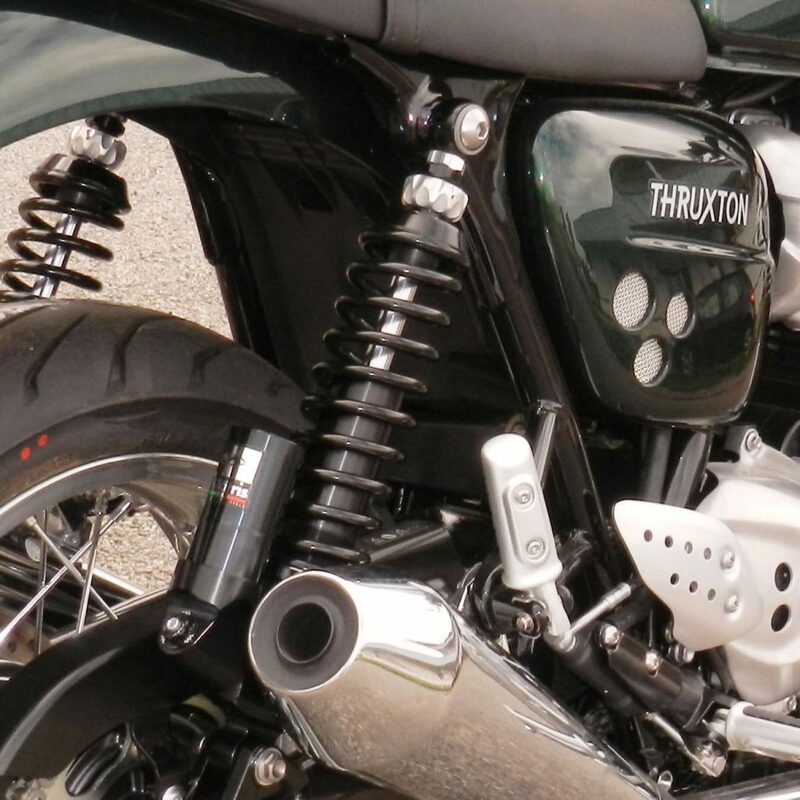 Nuova linea "BlackEdition" per i twinshock della serie M40KC dedicati alla gamma HarleyDavidson e a tutte le CafeRace, Classic & Vintage. Iideale per uso Touring e Sport, di facile regolazione per un perfetto set-up, maggiore comfort e sicurezza di guida. 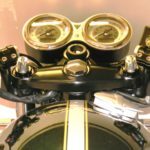 Per alcuni modelli di moto, disponibile anche la regolazione di Interasse per una maggiore personabilizzazione dell'assetto. 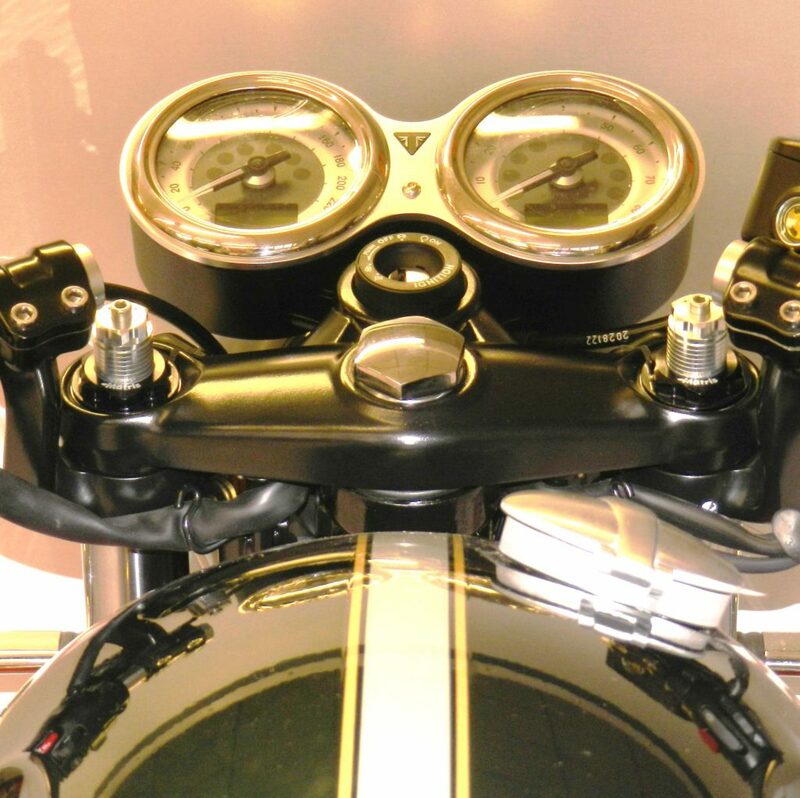 New "BlackEdition" line for the twinshock series M40KC for HarleyDavidson and all CafeRace, Classic & Vintage bikes. Ideal for Touring and Sport use of very easy adjust for the road rider to get a right set-up. 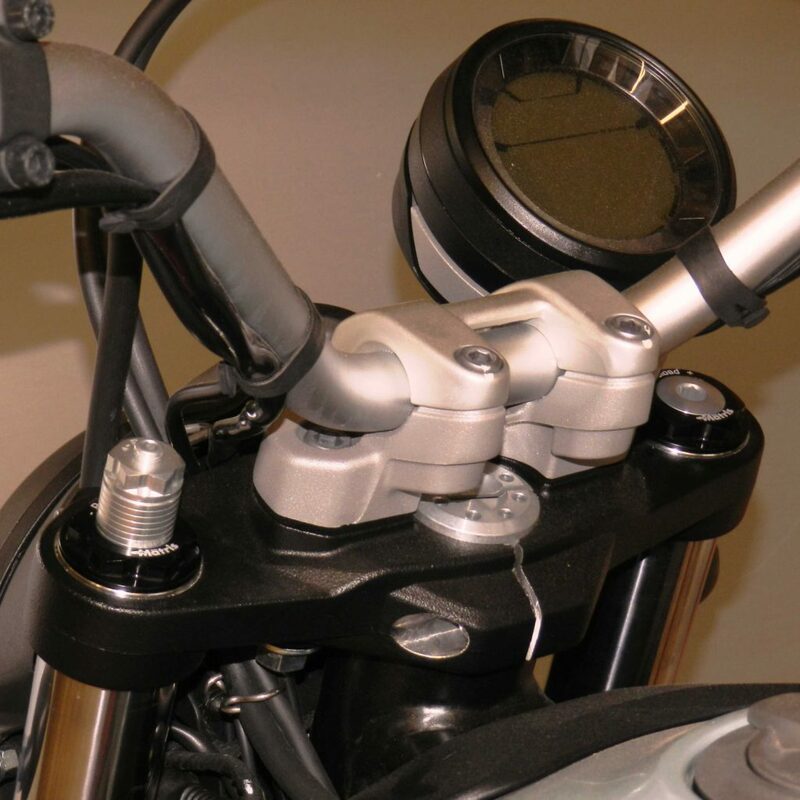 Where possible, some are also adjustable for length and ride height for a customizable setting of the bike. For the new "light" Yamaha sport bike, have been developed specific products to improve performance and setup. Per la nuova "piccola" sportiva di Yamaha sono stati sviluppati prodotti specifici, per migliorare setup e prestazioni. Per personalizzare e migliorare assetto e ferformance del maxiscooter Yamaha T-Max 530 m.y.2015, è disponibile una gamma completa e specifica di monoammortizzatori posteriori, serie M46KD & M46KF con possibilità di regolazione in Compressione, Estensione, Interasse e Precarico molla (disponibile anche precarico molla idraulico) abbinata alla gamma di kit forcella, serie FKS & FRK e cartuccia idraulica pluriregolabile serie F12S. To customize and improve setting and ferformance of the maxiscooter Yamaha T-Max 530 m.y.2015, is available a full range ofspecific rear shock, series M46KD & M46KF with adjustment of Compression, Rebound, Length and Spring Preload (alsoavailable hydraulic preload option) combined with a range of front fork kit, series FKS & FRK and also to the multiadjustablehydraulic cartridge series F12S. Per la maxi-enduro XT1200Z inserita a listino una linea specifica di prodotti per migliorare e personalizzare assetto e performance. For the maxi-enduro XT1200Z added to the pricelist a specific line of products to customize setting and improve performance. Updated the range of available products for the Monster 696-796-1100-1100Evo. 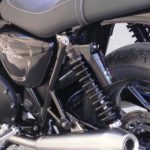 To the products already available to customize and improve performance and comfort (multiadjustable rear shocks type M46KD & M46KF and Fork Kits type FKS, FRK & F12S), for sport riders, added the new range of steering damper kits (type SDK & SDR) to reduce shaking of the front wheel and provide greater safety at high speed. 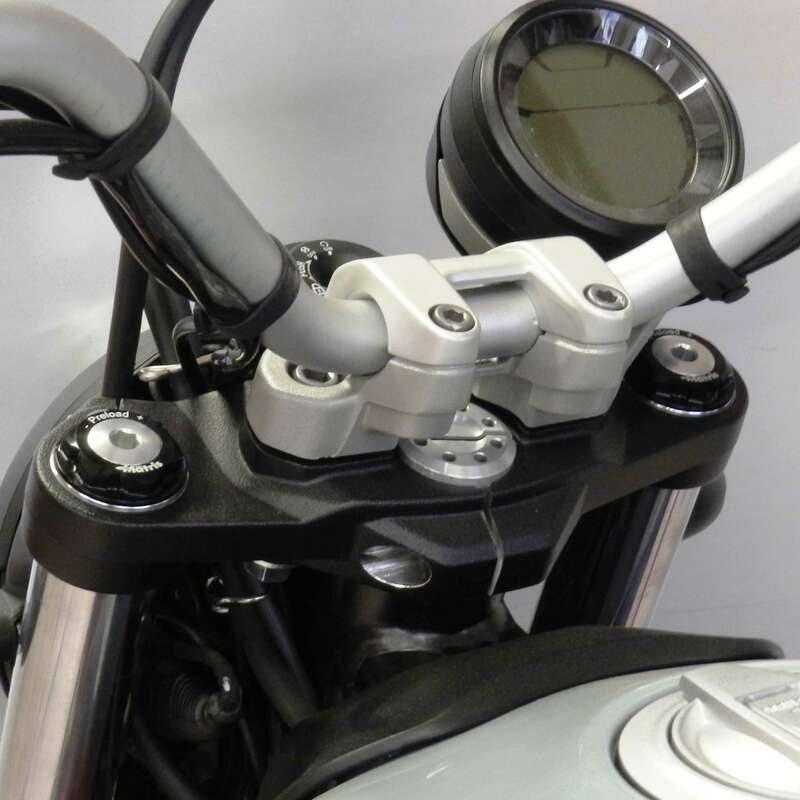 Aggiornamento della gamma prodotti disponibili per Monster 696-796-1100-1100Evo. Ai prodotti già disponibili per personalizzare e migliorare prestazioni e comfort (monoammortizzatori posteriori pluriregolabili serie M46KD & M46KF e Kit Forcella serie FKS, FRK & F12S) per i motociclisti più sportivi, ora disponibile ammortizzatori sterzo serie SDK & SDR per ridurre le vibrazioni della ruota anteriore e garantire una maggiore sicurezza di guida ad alta velocità. front fork kits (type FKS & FRK) plus the F12S multi-adjustable hydraulic cartridge (with set of springs in different rates for a total custom). kit forcella anteriore (serie FKS & FRK) ed inoltre la cartuccia idraulica completa pluriregolabile F12S. con possibilità di tarature e molle dedicate. Kit cartuccia idraulica completa per trasformare una forcella tradizionale non regolabile in una forcella con caratteristiche di tipo sportivo, completamente regolabile nel Precarico Molla e nelle funzioni separate di Compressione ed Estensione, consentendo una maggiore personalizzazione della taratura e dell’assetto. • Cilindro cartuccia d.20 mm in lega di Aluminio con trattamento di lappatura e anodizzazione. • Asta pompante d.12 mm in lega Al 7075 con trattamento di lappatura e ossidazione dura. • Set completo pistoni di compressione ed estensione lavorati dal pieno in lega Alluminio, completi di pacchi lamellari specifici per un totale controllo dei flussi idraulici. • Set molle di tipo lineare in lega di Acciaio Si-Cr disponibili in diverse costanti elastiche per una completa personalizzazione. Complete hydraulic fork cartridge kit that completely replace all the existing fork internals to modify a conventional non-adjustable fork in a fully-adjustable fork, with Spring Preload and separate funtions of Compression and Rebound adjustments, as in a sports fork type, allowing a greater custom setting. • Fork cartridge cylinder 20 mm in Alu alloy, with lapping and oxidation surface treatment. • Pumping rod 12 mm in Alu alloy Al 7075, with lapping and hard oxidation surface treatment. • Set of Compression and Rebound valves, machined from Alu billet, with its own dedicated shims pack for a total hydraulic flows control. • Set of linear spring in Si-Cr alloy Steel, available in different rates for a total custom. The fork kit is fully reversible. 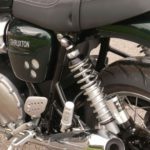 No modification to the original fork is required for assembly the fork kit and is completely overhauled for a proper and regular maintenance. Fork kit supplied with specific oil (Motorex Fork Oil). Nuova linea "BlackEdition" per i Twinshock della serie M40 dedicati alla gamma HarleyDavidson e a tutte le CafeRace, Classic & Vintage. Ammortizzatore di tipo idraulico, con serbatoio interno pressurizzato Azoto, con regolazioni di Estensione & Precarico molla. Cilindro d.40 mm in lega di Alluminio con trattamento di ossidazione anodica. New "BlackEdition" line for the twinshock series M40. for HarleyDavidson and all CafeRace, Classic & Vintage bikes. Rebound & Spring Preload adjustable hydraulic shock with inside pressurized tank (Nitrogen gas N2). Shock cylinder d.40 mm in Alu alloy with lapping and oxidation surface treatment. Piston rod d.16 mm in high tensile alloy steel with hard Chrome surface coating.